Young Dental Disposable Prophy Angles | Young Dental Laboratory, Inc.
Young’s Classic and Contra disposable prophy angles are known for their stability, performance, and feel. The Classic body features a 90-degree bend, while the Contra has a bend in the body, which allows for easier access to posteriors. In addition, Young’s screw-type prophy cups provide smooth, concentric rotation for a wobble-free performance. I have been using this product for years. It is easy to reach all aspects of the tooth. The cup is firm but adapts to the tooth surfaces. Very rarely are there any defects in the disposable head. 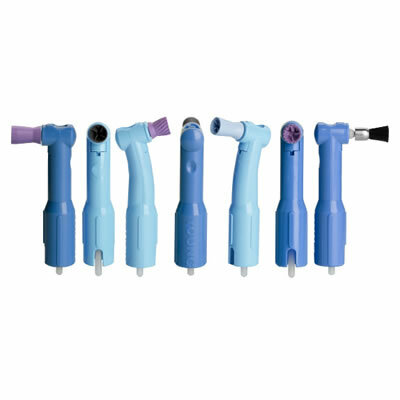 They are not noisy and are easy to fit any prophy handpiece. The prophy angle is satisfactory. The rubber cup does not adapt under the cervical margin as well as I would like, but it does the job. Occasionally the shaft does not slide into my RDH prophy angle as smoothly as I'd like. On opening the box, there is a rubber tire smell. Young prophy angles are easy to polish with and get quality result. It stretches well to cover all around the tooth surfaces, and thin enough to go between the contacts and retractable gum tissues. Name could use a little pizzazz! I was telling a patient just yesterday when I had a malfunction of one of my prophy angles that this was a first for me. I have used this angle for YEARS and this was the FIRST malfunction I can remember having during a prophylaxis. I love the reliability of this angle and I am VERY brand loyal when I find something that I love and is so reliable! There's a reason why this angle has been used in our office exclusively for the last 30 years--unfailing quality, dependability, and performance. Smooth running, rarely stalls. The only factor affecting a purchase decision would be if there were any dealer specials, so that a greater quantity could be ordered. This will remain the brand of choice for my practice. I've been using Young angles for forty years and think they are superior to all their competitors. The new Elite Series though, are just great. The side grooves really do polish and the cup is just as pliable as the latex version. Great product. I have used alot of different disposable prophy angles in my 30+ years of practice and have yet to find one that is as reliable as the Young prophy angle.I have tried other brands as the sales reps come thru,but always go back. The cups rarely rip and you can use alot of pressure without the cup stopping .